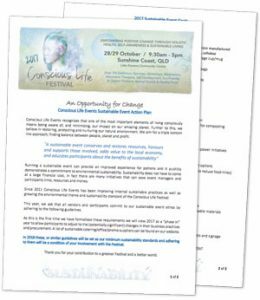 This year, we ask that all vendors and participants contribute to our sustainable event ethos by adhering to the CLF Sustainability Action Plan. Please read carefully and note which guidelines may apply to your business. 2017 was a “phase in” year for the guidelines, to allow participants to adjust to the (potentially significant) changes in their business practices and procurement. From 2018, these guidelines serve as our minimum sustainability standards and adhering to them will be a condition of your involvement with the Festival. Thank you for contributing to a greener festival and a better world.